We are happy to announce that Cambridge-based insurance brokers, One Broker, are supporting the Stradivari Trust Concert Series at Hughes Hall. For many years we have worked with the team at WeLoveMusicians, part of One Broker, to insure many of the instruments in our portfolio. 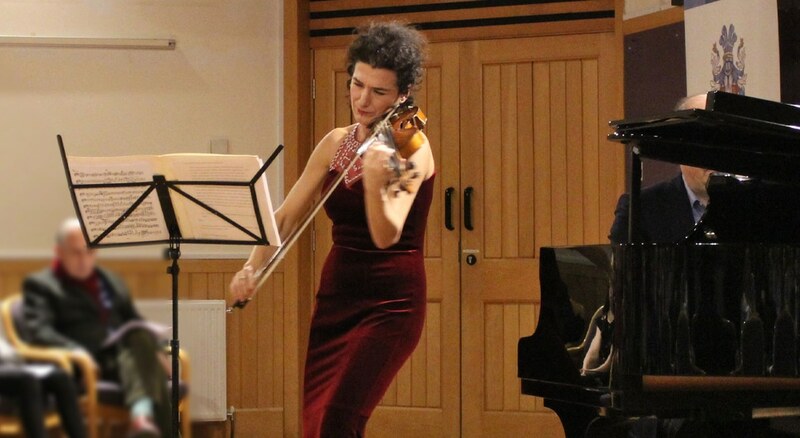 Our two most recent concerts featured renowned Albanian violinist Alda Dizdari and the award-winning Jubilee Quartet. Hosted in the Pavilion Room at Hughes Hall , Alda’s concert in December featured three epic pieces, accompanied by pianist Tom Blach. Kicking off with Szymanowski’s Mythes, the duo then played a rousing performance of Elgar’s Violin Sonata in E minor, Op. 82. Elgar’s music appears particularly close to Alda Dizdari’s heart, being the subject of her book ‘Kiss me Again: A Memoir of Elgar in Unusual Places’. The account details the author’s journey performing Elgar’s concerto in her native Albania plus other Eastern European cities. The concert concluded with a captivating rendition of Ravel’s Tzigane, sparking rapturous applause from the audience as Alda and Tom took a bow. January’s Jubilee Quartet concert proved very popular with Stradivari Trust supporters and College members alike, with the Quartet performing works by Schubert, Mendelssohn and Beethoven to a packed Pavilion Room. Their performance of the Mendelssohn String Quartet No. 2 in A minor was particularly haunting, played with exquisite timing and great style. The Stradivari Trust is proud to have supported this talented young Quartet for several years. Julia Loucks, Violin II, plays a rare early Giovanni Grancino violin from c 1685, acquired through one of our instrument syndicates, whilst Tereza Privratska, Violin I, and Lorena Cantó Woltèche, Viola, play instruments on loan from Nigel Brown.